← Gimme Back My Burgers!!! Yesterday on my way to work, I just happened to pass by what turned out to be a Collegehumor.com April Fool’s Day Prank. They hired actors to dress up as In-N-Out Burger employees, had them stand in front of signs and hand out fliers announcing the NYC arrival of the west coast burger chain. Being the savvy blogger that I am (read – “media ham”) I stopped, took a photo and updated the Burger Conquest twitter with the picture. The post got re-tweeted by my favorite food site on the web, A Hamburger Today. They also posted a story on the hoax with my photo. The timing couldn’t be better as this happened on the day that I played my Salad Conquest April Fool’s Joke. I sat back and laughed about the whole thing. The fact that the site has readers and people enjoy it, is really special and I am grateful, but it’s all just for fun. You see, I love writing this site and I love eating burgers but it’s nothing I take seriously. So when I get a message from NY1, the 24 Hour all New York news channel, asking for permissions to use my photos in their 11 pm newscast, I erupted with joy filled laughter. I without a doubt said yes, ran home and set my DVR to tape it. 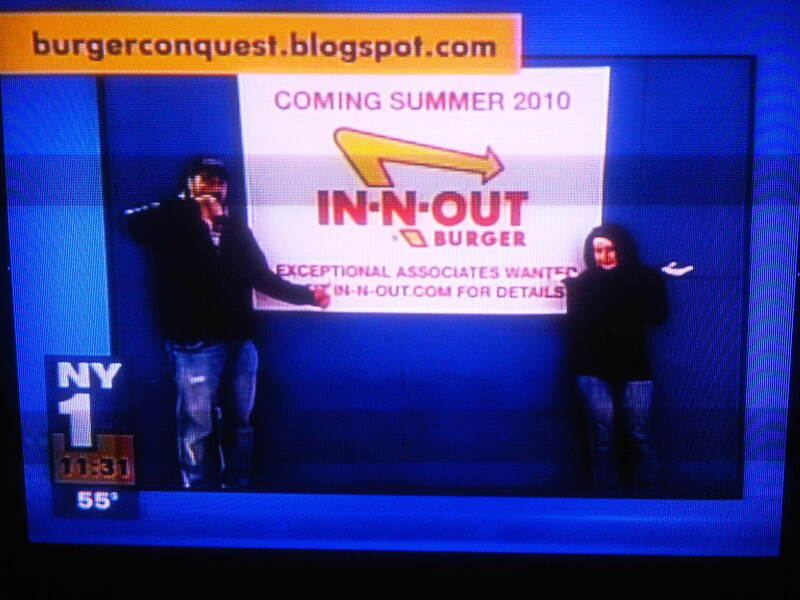 Sure enough, there I was, alongside of THE most loyal Burger Conquester, Jackie, on the 11 pm NY1 newscast with the Burger Conquest URL clearly emblazoned across the screen!!!! Watching NY1 is a New Yorker’s right and unless you live here, it’s impossible to understand how cool it is to be put on their channel. While it wasn’t the first time I made the news, it was definitely better than the last time. While being interviewed about helmet safety laws, I accidentally crashed a moped for a news report. Yup, that’s a younger, dumber, accident prone version of me, complete with mullet and an inability to ride a simple scooter down the street. Since then, I got a haircut, bought a clue, moved to New York, started a burger blog and most importantly, got rid of the moped. Look at me now, I’m burger famous! This entry was posted in Uncategorized and tagged the great burger conquest hamburger cheese french fries review in-n-out in n out new york hoax college humor collegehumor salad ny1 news 11 pm famous. Bookmark the permalink.